Calculated Risk: EIA: "U.S. energy trade with Mexico: U.S. export value more than twice import value in 2016"
EIA: "U.S. energy trade with Mexico: U.S. export value more than twice import value in 2016"
Energy trade between Mexico and the United States has historically been driven by Mexico’s sales of crude oil to the United States and by U.S. net exports of refined petroleum products to Mexico. Through 2014, Mexico’s exports of crude oil to the United States were the most valuable component of bilateral energy trade, with the overall value of Mexico’s U.S. crude oil sales far exceeding the value of U.S. net sales of petroleum products, primarily gasoline and diesel fuel, to Mexico. 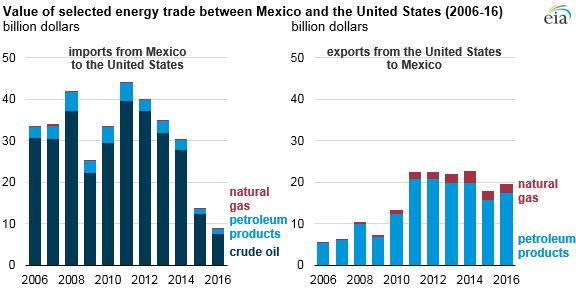 From 2006 through 2010, for example, the value of U.S. energy imports from Mexico were two to three times greater than the value of U.S. energy exports to Mexico. The bilateral energy trade situation with Mexico has changed significantly in recent years. 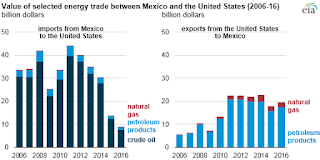 In 2015 and 2016, the value of U.S. energy exports to Mexico, including rapidly growing volumes of both petroleum products and natural gas, exceeded the value of U.S. energy imports from Mexico as volumes of Mexican crude oil sold in the United States continued to decline. For 2016, the value of U.S. energy exports to Mexico was $20.2 billion, while the value of U.S. energy imports from that country was $8.7 billion. CR Note: The recent change in energy trade with Mexico will probably come as a surprise to many.